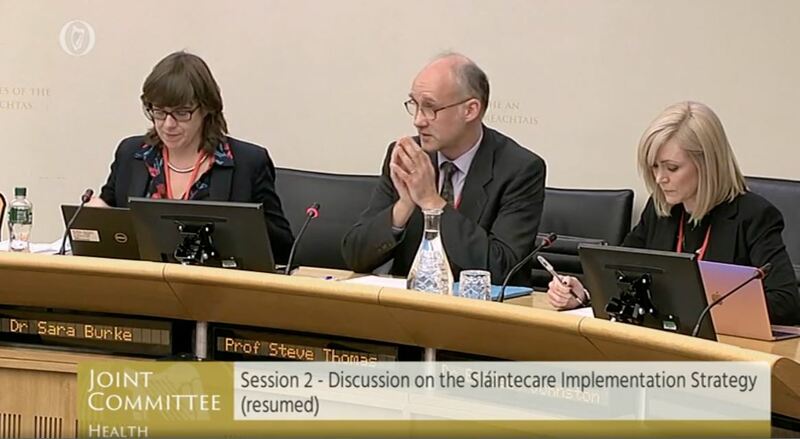 On 3 October 2018, members of the Pathways project team Prof Steve Thomas, Dr Sara Burke and Dr Bridget Johnston gave a presentation to the Oireachtas Committee on Health evaluating the Sláintecare implementation strategy published in August by the Department of Health and answered committee members’ questions. On Wednesday 26 September 2018, the Mapping Pathways to Universal Healthcare research team hosted their final seminar presenting research findings from the four-year HRB funded project and led a robust dialogue with the over 120 people in attendance. In addition to presentations from Project PI Prof Steve Thomas, Project Co-ordinator Dr Sara Burke and team members Dr Bridget Johnston, Dr Sarah Barry and Maebh Ní Fhalluin, presentations were given by Rob Yates, Project Director, Universal Health Care Policy Forum, Centre on Global Health Security, Chatham House, London whose talk was entitled ‘Implementing universal healthcare – reasons for hope – lessons from the international literature’ and Laura Magahy, executive director of Sláintecare Programme Office who spoke about her approach to implementing Sláintecare. 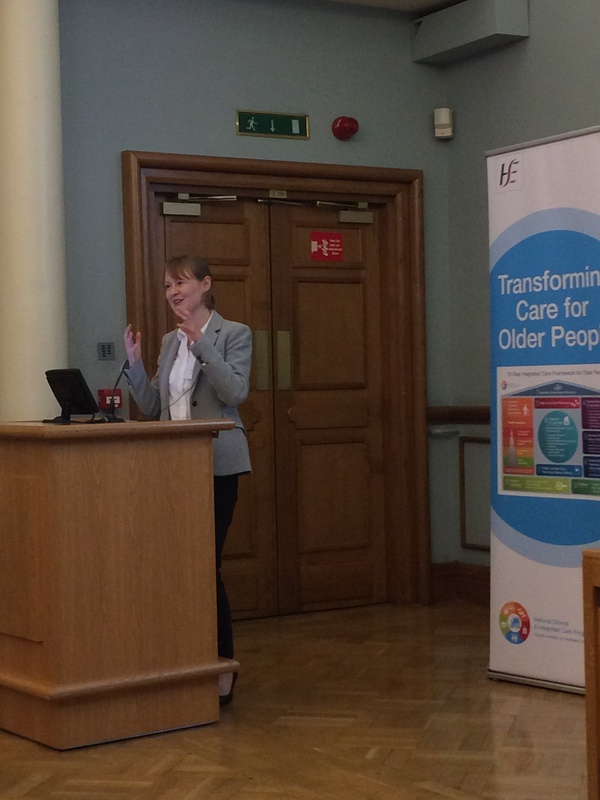 Dr Sarah Barry, Dr Sara Burke and Maebh Ní Fhallúin presented and hosted a workshop at the HSE Integrated Care Programme for Older Persons (ICPOP) annual Network Day in Dublin Castle on 21 June 2018. 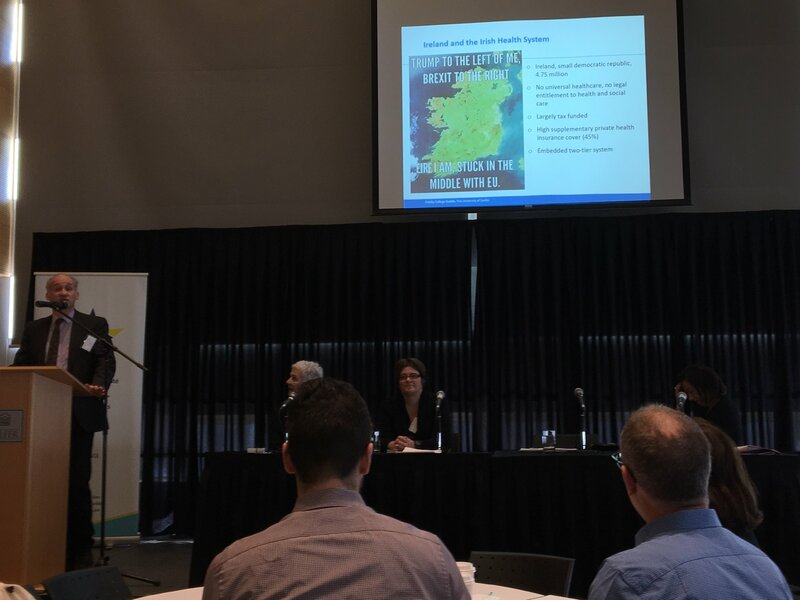 Sarah provided the national policy context with a review of Sláintecare and presented results from her survey of +200 senior level health and social care practitioners who are currently implementing integrated care in older people’s services. She discussed top level findings arising from her research including current capacity, constraints facing decision makers throughout the system and tools to support implementation. Maebh presented early findings from her case study of the Integrated Care Programme for Older Persons. This research involved co-designed participant observation in three ICPOP pioneer sites, carried out between February and June 2018, where she observed and documented the activities of the integrated care teams. Her early findings underline the importance of contextual factors influencing implementation, the unique nature of each local site and the natural supports available. She also identified key competencies for delivering integrated care and opportunities to progress integrated care at a local level. Two-tier healthcare: Can Canada learn from the Irish experience? Steve’s presentation using findings from the Pathways project, discussed the problems arising from the two-tier nature of the Irish healthcare system. Though primarily financed by taxation (69% in 2015), private finance has played a critical and long-standing role in unlocking access to care at almost every level in the Irish health service. 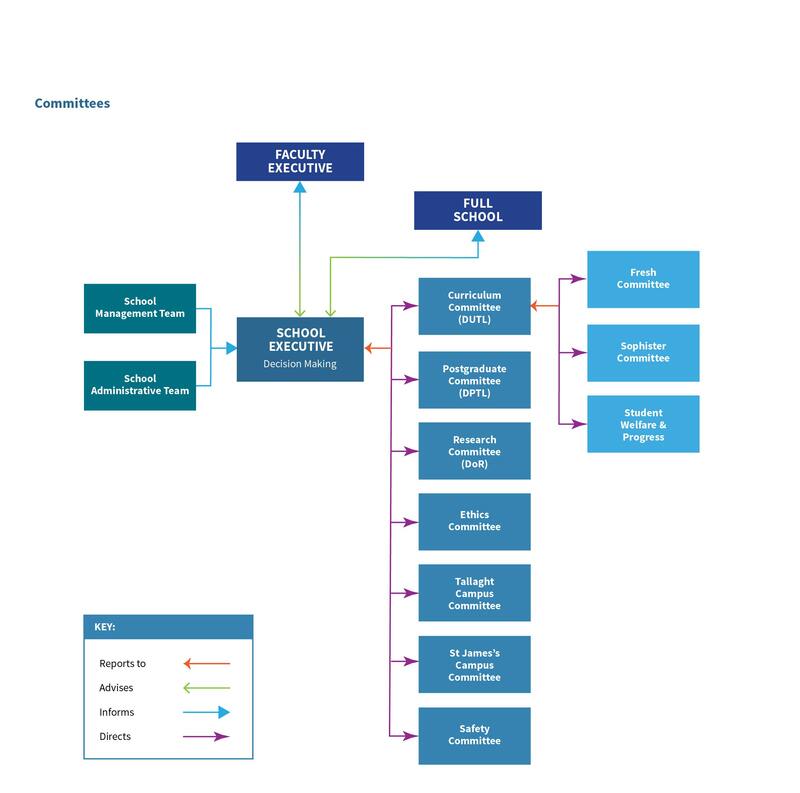 The Irish system is unusual in that those enrolled in private insurance can jump waiting lists and get access to consultant provided acute care. New household budget data comparing 2009/10 and 2015/2016 shows that households spending on private health insurance is crowding out spending on GPs and dentists. Further many poorer households are incurring unaffordable spending on private insurance. 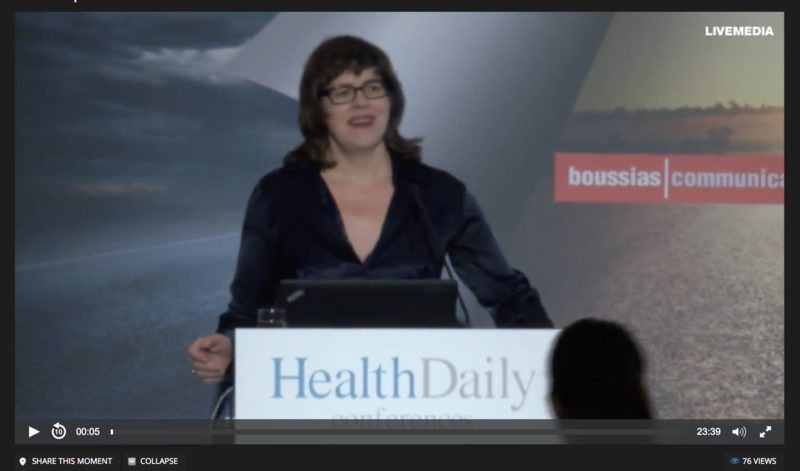 Dr Sara Burke delivered a keynote speech at at the Future of Healthcare in Greece conference on 22 March 2018. The conference is the biggest annual event on healthcare policy in Greece and this year focused on healthcare initiatives in the EU that create opportunities for supranational cooperation and cross-sector partnering. Sara’s presentation provides a succinct overview of the complicated way the Irish health services is organised with significant inequalities in access to healthcare and lack of entitlements. She also discusses the Sláintecare policy making process and the what would happen if it were fully implemented. 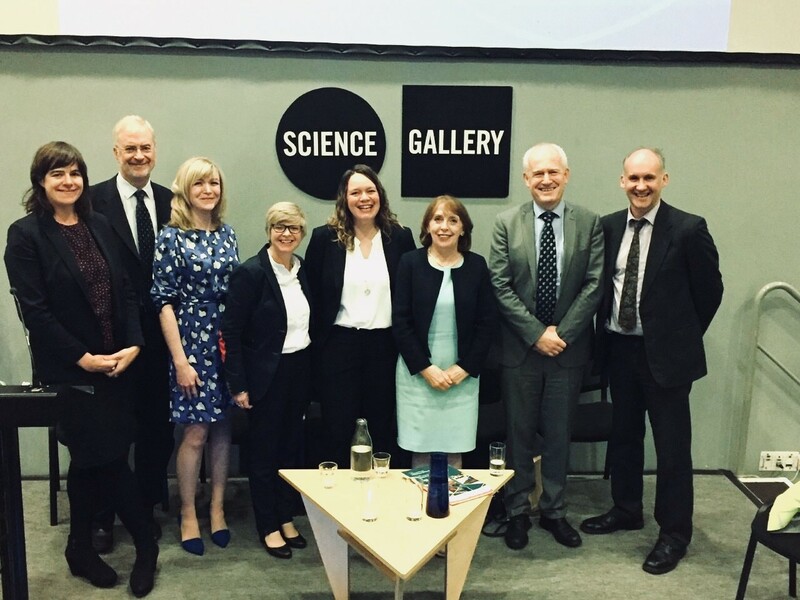 The Pathways project research team were shortlisted for the TCD Registrar’s Civic Engagement Award for their contribution to the work of the Oireachtas Committee on the Future of Healthcare. The award is recognises members of Trinity College staff who have demonstrated outstanding achievements in engagement with wider society in their teaching and/or research, those who have played an active role in civic engagement in Trinity either through community-based research and/or community-based learning. A key recommendation of the Sláintecare report is the removal of private practice from public hospitals. 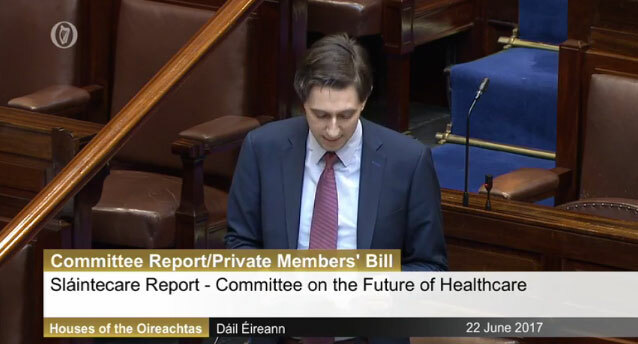 An Independent review group examining the removal of private practice from public hospitals was established by Minister for Health Simon Harris in December 2017 and made a public call for submissions. Pathways team researchers led by Dr Sara Burke recently produced a submission to the Review Group providing evidence and findings from research projects Resilience of the Irish Health System and Pathways to Universal Healthcare to inform their work. 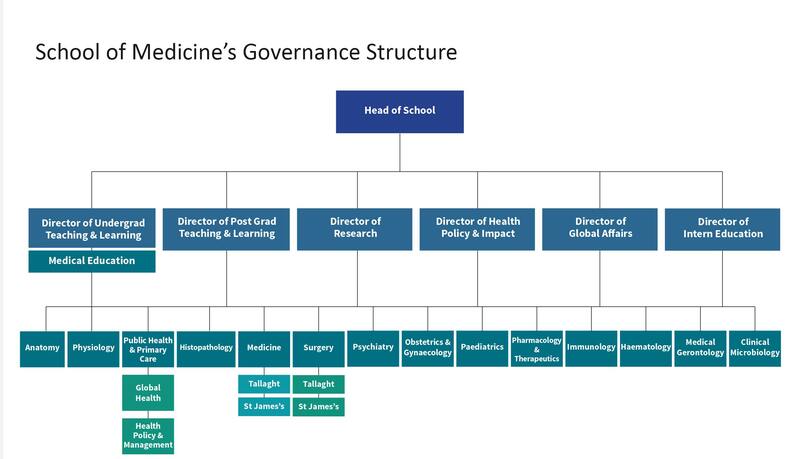 The ‘Pathways to Universal Healthcare’ project team in the Centre for Health Policy and Management has recently commenced the final project phase. Led by Dr Sarah Barry, the team will collaborate with the HSE to evaluate three pilot sites, in Tallaght, Wexford and Sligo, where Integrated Care for Older Persons is being implemented. Researchers will use an innovative co-design approach by developing methods of participant observation in consultation with local participants. Also, a series of outputs will be produced for participants during the study process so that new insights and knowledge can inform ongoing practice and planning. The field work will run until the summer of 2018. 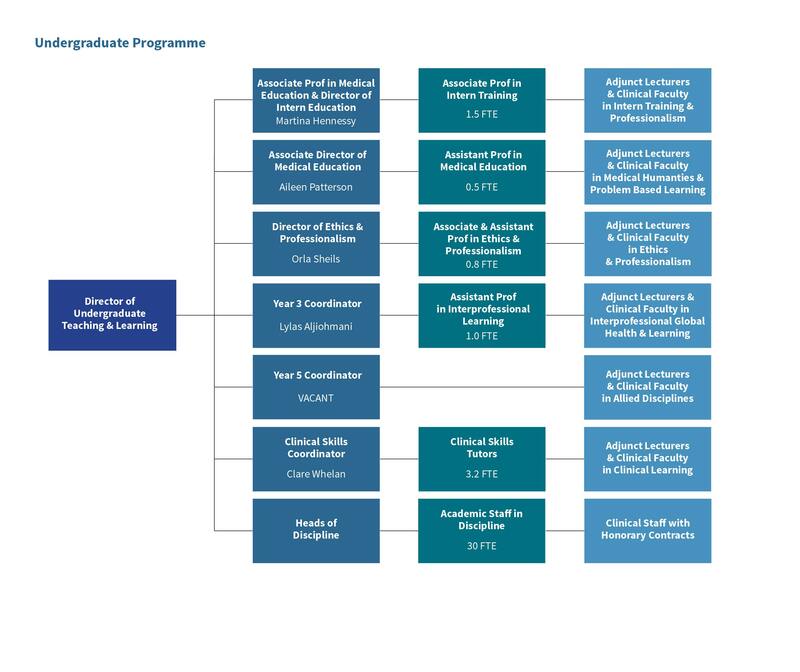 These case studies on ‘integrated care’ and ‘the change process in action’ will build on previous work undertaken by the team examining the organisational challenges of moving to Universal Healthcare (UHC), including a systematic review and a survey of CEO-level health managers. Professor Steve Thomas presented to the first annual National Healthcare Outcomes Conference on 20 February 2018. Steve’s presentation was entitled ‘Universal Healthcare Funding and System Level Outcomes’ and focused on the need for measuring and promoting health outcomes for the population and health system as a whole, not just for some groups and some conditions. The key goals for the Irish healthcare system as a whole in pursuit of better outcomes on a population level, Steve argued, is to promote affordability, progressivity of financing and equity of access. Dr Sarah Barry presented a keynote address at the 14th annual Health Summit on 8 February 2018 which focused on next steps for the Committee on the Future of Healthcare report, Sláintecare. She discussed in particular at the challenges in implementing major health reform and in creating sustainability in an environment with ever growing health needs and costs. The title of Sarah’s presentation was “The key challenges of moving to an integrated care model of healthcare” and mapped the features of health system environment that enable integrated care as well as its challenges. The Pathways Seminar on 19 September was covered in the Irish Independent. The article reports on the new data shared in the seminar and the finding that Irish "households are avoiding GP visits and dental care in order to afford the cost of rising private health insurance premiums". 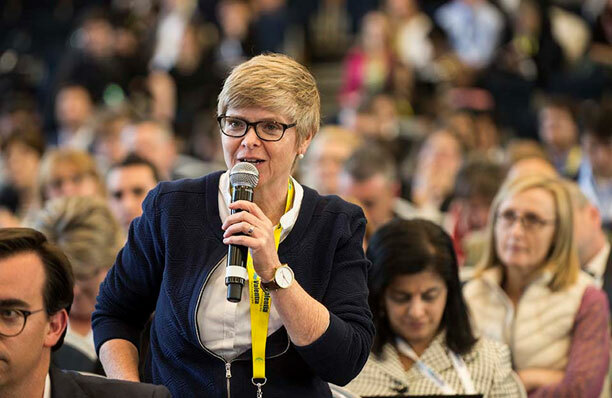 The article quoted Pathways team member Bridget Johnston with a warning: "The trend of cutting back on GP and dental care is a matter of concern. Delayed treatment risks health problems becoming more significant. It is a negative development. . . the spend on health insurance is squeezing out other services - these are health services we need now". The Pathways team hosted their second seminar on 19 September at the Science Gallery at Trinity College. 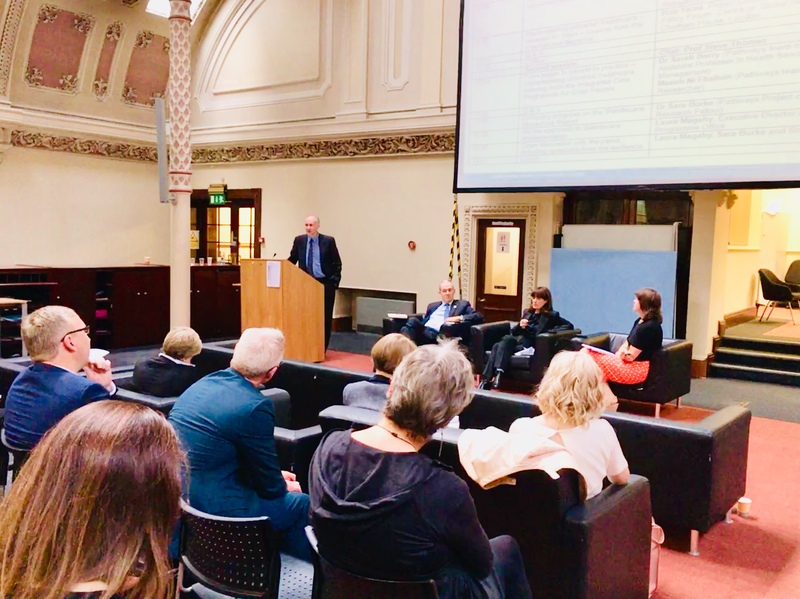 There was a full house with over 150 registered participants from a wide swath of interested parties which led to good interaction with inputs and engagement from the floor on the potential pathways to and outcomes of universal healthcare in Ireland. In addition to presentations from the Pathways team - Dr Steve Thomas, Dr Sara Burke, Dr Bridget Johnston, Dr Sarah Barry and Rikke Siersbaek - Roisin Shorthall, TD, Chairperson of the Oireachtas Committee on the Future of Healthcare and Dr Josep Figueras Director of European Observatory on Health Systems and Policies and head of the WHO European Centre on Health Policy in Brussels each presented. 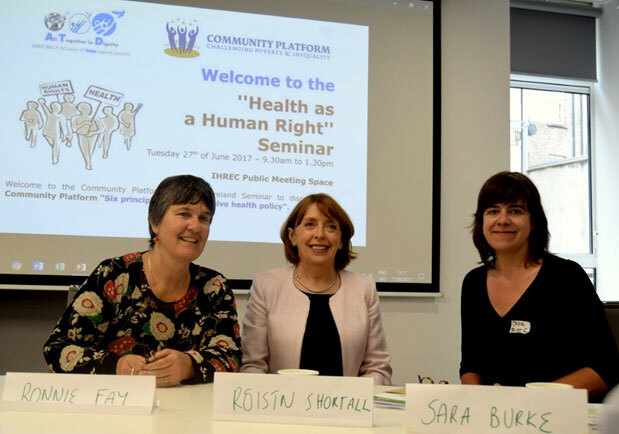 On 27 June 2017, Dr Sara Burke presented at a seminar hosted by the Community Platform and All Together in Dignity Ireland. Sara’s presentation was entitled ‘Why Ireland has never had a universal health system and will we ever have one?’ during which she traced the history of the Irish health system, assessed why we have never had universal healthcare and suggested we are now at a critical juncture where achieving universal healthcare is possible due to the recent publication of the Sláintecare report. The Chair of the Committee on the Future of Healthcare, Roisin Shortall, TD took part in a panel discussion on next steps for Sláintecare, alongside Sara Burke and Ronnie Ray from Pavee Point. There were inputs from Our Voices about Health project and assessment of how the Community Platform’s six principles for inclusive health policy intersected with Sláintecare. A full transcript of the debate is available here and a video of same can be viewed here. Dr Sarah Barry presented to a HSE Integrated Care Programme for Older Persons pioneer sites meeting on 21 June 2017. Drawing on her systematic review, Sarah discussed the gap in the scientific literature on the topic of organisational challenges to implementing Universal Healthcare. As part of the Pathways project, upcoming research is planned to fill that gap. HSE Managers in the Integrated Care Programme for Older Persons are invited to take part in case studies to uncover potential learnings from their experiences in implementing integrated care in various settings in Ireland. Studying the implementation of integrated care will contribute to the knowledge base on implementing Universal Healthcare because both accrue to the same goals - in other words integrated care is the preferred method for implementing Universal Healthcare. Attendees responded with enthusiasm and great interest for the research which is due to commence in September, and a number of them are keen to take part. 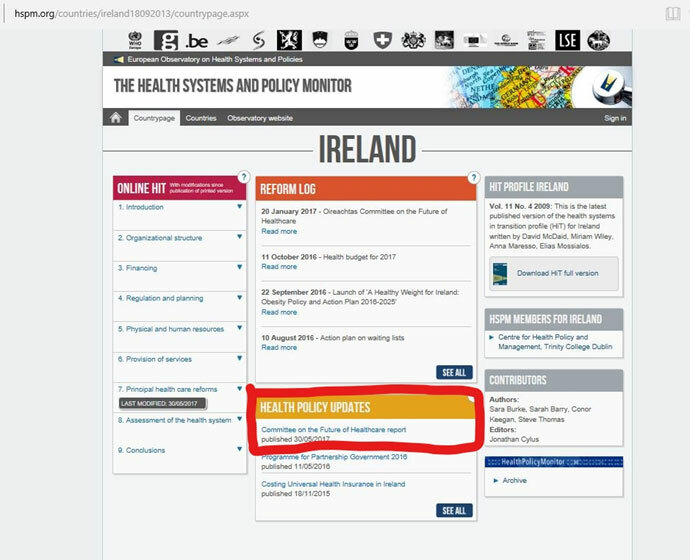 Pathways team members author the Irish page for the WHO’s Health Systems and Policy Monitor. Dr Sara Burke and Dr Steve Thomas recently wrote a Health Policy Update for the site about the recent work with the Oireachtas Committee on the Future of Healthcare. Read it for a short synopsis of Sláintecare. Click here for the link and click the image to see where to find the report on the HSPM website. From November 2016 to May 2017, the Pathways team provided technical support for the Oireachtas Committee on the Future of Healthcare. 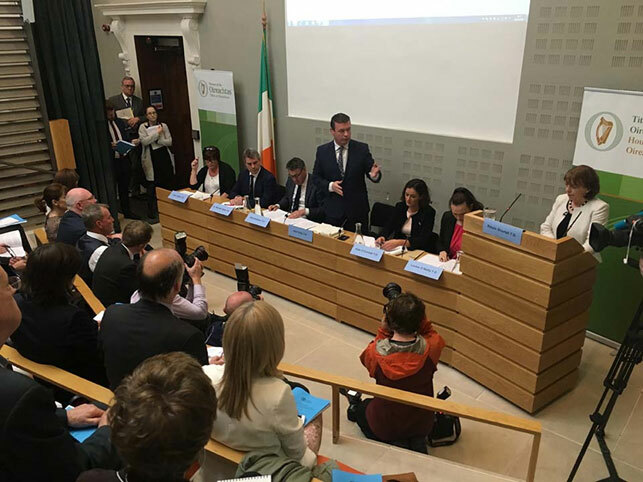 Initially, the team hosted three workshops with the Committee and then assisted the Committee with its remit ‘to devise cross-party agreement on a single long-term vision for health care and direction of health policy in Ireland’. On the 30 May 2017, the Committee published its final report. 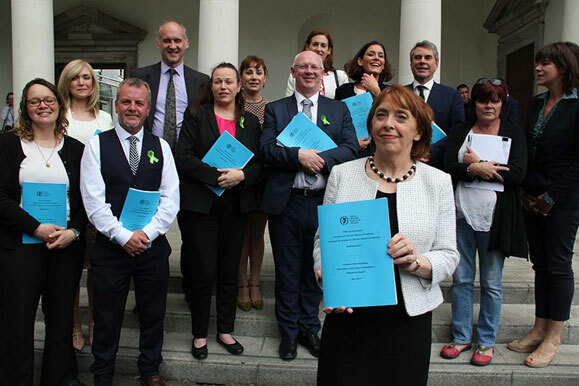 According the Committee’s chairperson, Roisin Shortall TD, ‘the formation of the Oireachtas Committee on the Future of Healthcare provided a unique and historic opportunity for TDs from across the political spectrum to come together to develop consensus on a long-term policy direction for Ireland’s healthcare system. Our task has been to consider how best to ensure that, in future, everyone has access to an affordable, universal, single-tier healthcare system, in which patients are treated promptly on the basis of need, rather than ability to pay’. An overview of the Committee’s work process and the report’s recommendations can be found in the Oireachtas News press release. View full video of report launch here. Dr. Sarah Barry presented at the International Conference on Integrated Care which took place in Dublin 8-10 May, 2017. Sarah presented on the topic of organisational challenges to implementing universal healthcare sharing findings from the systematic review which is a key element of the Pathways project. The Review answers the question: What organisational challenges can be identified during implementation of universal health care/coverage policies in health systems in countries with a GDP per capita greater than $22,000? 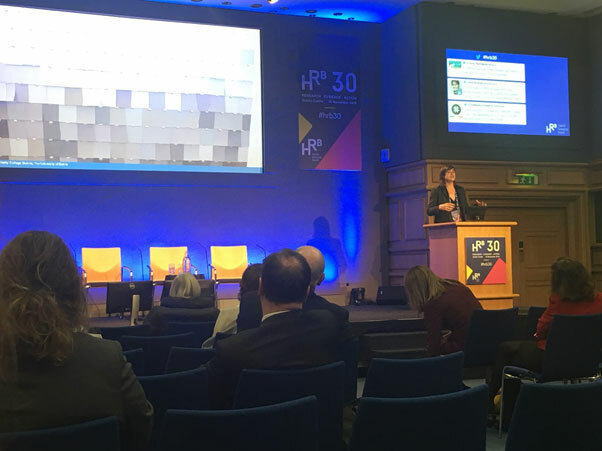 Dr Sara Burke was a speaker at the HRB30 conference on 30 November 2016. 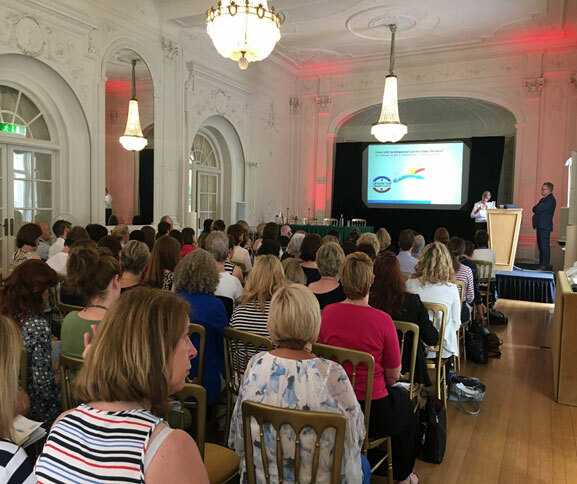 The conference was a celebration of the thirtieth anniversary of the Health Research Board (link to HRB30) and featured research projects who have used HRB funding 'to provide outstanding evidence to support positive changes in health policy or practice'. Central to the presentation was the Centre’s HRB funded work under the leadership of Dr Steve Thomas on our previous Resilience project and our current Pathways project. The conference showcased how research evidence can significantly improve the level and efficiency of services in the Irish healthcare system. 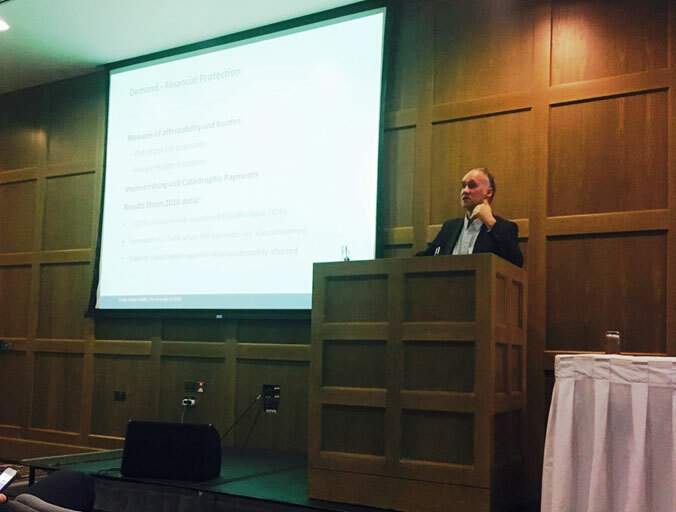 Dr Steve Thomas gave a presentation entitled Making Headway towards UHC to the Policy Forum for Ireland on 9 November. The transcript of the presentation (scroll down to page 40!) and the slides give an overview of our current progress on the Pathways project. 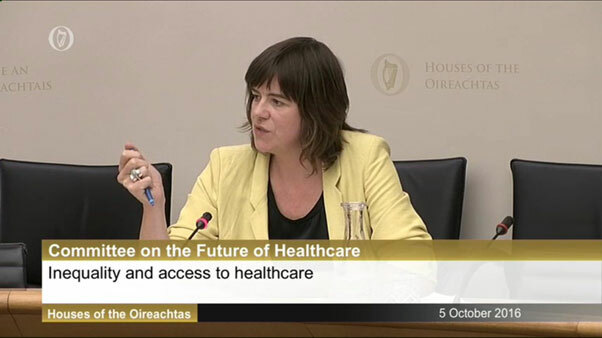 Dr Sara Burke, the coordinator of the Pathways project presented to the Oireachtas select committee on 5th October 2016 on the topic of inequality and access to healthcare in Ireland. Our first Pathways seminar took place in September 2015. The agenda with links to the presentations given provide many details about the work completed up to that stage.